Twenty years after the opening of the state monopoly over oil and gas activities, the oil industry in Brazil is growing steadily and has matured. Complex deals are becoming more common as the portfolio of exploration and production companies enter into the production phase and service providers start to prepare for the upcoming challenges. In 2017, Brazilian proven oil reserves decreased 1 per cent in comparison with 2016, representing 12.8 billion barrels of oil. The country is ranked 15th among the world's biggest proven oil reserves. National oil production reached 2.6 million barrels per day in 2016, and the production of pre-salt totalled 1.3 million barrels of oil equivalent per day, a volume 30 per cent higher than in December 2016. The country is ranked 10th among the world's biggest oil producers. As regards liquefied natural gas (LNG), production rose 14.5 per cent in comparison with 2016, hitting 40.5 million barrels of oil equivalent per day. Despite falling oil prices, recent month-by-month statistics show that production is still increasing and pre-salt production rates are improving considerably. During the second half of 2018, the federal government held the 14th concession bid round and the fourth bid round for pre-salt areas. The Brazilian oil and gas sector is regulated by general provisions of the Brazilian Constitution, as well as by a number of different federal laws, and ordinances and resolutions enacted by the Brazilian National Oil, Natural Gas and Biofuels Agency (ANP). After the enactment of Constitutional Amendment No. 09/1995 the federal government's monopoly over exploration and production of oil and gas reserves was loosened, allowing the federal government to contract state-owned or private companies. Pursuant to Articles 20 and 176 of the Brazilian Constitution, oil and gas reserves located on Brazilian territory (including continental shelf, territorial sea and exclusive economic areas) are considered assets of the federal government, and, according to Article 177, the government can contract the exploration and production of deposits of oil, natural gas and other hydrocarbons. Federal Law No. 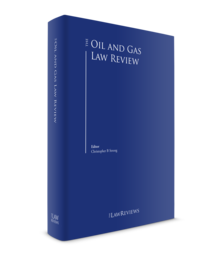 11,909/2009 (the Gas Law) was enacted to specifically regulate gas activities in Brazil, clarifying the legal background for private investors. The Gas Law gave the Ministry of Mines and Energy the power to decide which pipelines must be built or extended, and established provisions focused on projects related to gas transportation, gas storage and LNG facilities. government takes for the PSA. The Ministry of Mines and Energy (MME) is mainly responsible for planning the use of oil and natural gas. The MME proposes to the CNPE, after consulting with the ANP, the definition of the areas that will be subject to concession agreement or PSA regime, and the technical and economic parameters for the PSA. The MME also approves the drafts of the bid documents and PSA prepared by the ANP. The CNPE has the main purpose of fostering rational use of the nation's energy resources, ensuring proper functioning of the national fuels inventories system, reviewing energy matrixes for different regions of Brazil and establishing guidelines. It is responsible for authorising the ANP to offer blocks under the concession regime and the PSA regime. The ANP is the national regulator of the oil, gas and biofuels industry, and is in charge of regulating, contracting and supervising economic activities related to the oil, natural gas and biofuels industry, as well as establishing technical standards for various connected activities. The ANP is also responsible for supervising compliance with safety standards and its regulations. The Federal Environmental Protection Agency (IBAMA) is responsible for environmental regulations regarding upstream offshore activities. For onshore activities, other state and local environmental agencies may also be competent to regulate upstream activities. The Brazilian Maritime Transportation Agency (ANTAQ) is responsible for regulation and supervision of maritime transportation of oil as well as maritime support activities. Only Brazilian navigation companies, duly authorised by the ANTAQ and the ANP, may perform maritime transportation and support activities within the country. The Brazilian Navy has multiple roles in offshore exploration and production. In addition to technical inspection and entry control for any vessel or platform, it has jurisdiction over any incidents that take place on Brazilian waters. It is also responsible for maintaining the registry of maritime property, such as vessels. With a view to the avoidance of double taxation, Brazil has entered into tax treaties with the countries listed below. These treaties executed by Brazil and its partners usually follow the Model Tax Convention of the Organisation for Economic Co-operation and Development (OECD) even though Brazil is not an OECD member. Brazil has entered into treaties with Argentina, Austria, Belgium, Canada, Chile, China, the Czech Republic, Denmark, Ecuador, Finland, France, Holland, Hungary, India, Israel, Italy, Japan, Korea, Luxembourg, Mexico, Norway, Peru, the Philippines, Portugal, Slovakia, South Africa, Spain, Sweden and Ukraine. Brazil has ratified the Convention on the Recognition and Enforcement of Foreign Arbitral Awards (the New York Convention) through Decree 4,311/2002. However, Brazil does not have significant bilateral investment agreements in force. As for tax information exchange agreements (TIEAs), Brazil has enacted Decree 8,003 of 15 May 2013, which put in force a TIEA entered into with the United States. From the end of Petrobras's monopoly in the 1990s and prior to the approval of the Pre-Salt Law, the only regime applicable for the granting of exploration and production rights in Brazil was the concession regime. At the end of 2010 the PSA regime was established to govern exploration and production on pre-salt areas and areas deemed strategic by the federal government. Therefore, there are two different regulatory frameworks for the granting of exploration and production rights in Brazil, each of them described below. Under the concession regime (similar to a tax-royalty regime), the granting of concession contracts for exploration and production activities is preceded by a tender (known as bid rounds). The tender documents must establish all technical, financial and legal criteria and requirements that a bidder must comply with in order to be qualified for the bidding round as non-operator or operator A, B or C. In general terms, the 'non-operator' is a capital partner; operator A is the company qualified by the ANP to operate in any block offered in the bid; while operators B and C are eligible to operate in some restricted blocks to be defined by the agency (usually in shallow waters and onshore, respectively). Companies may submit bidding offers individually or jointly in consortium. In case of a consortium, a qualified operator between them shall be indicated. There is no restriction on foreign participation, provided that the foreign investor incorporates a company under the Brazilian law and complies with all technical, legal and financial requirements established by the ANP before the execution of the concession agreement (or the PSA). Companies from the same corporate group are prevented from making competing offers for the same block. Under the PSA regime, a portion of the production of oil and gas is paid to the oil and gas companies as reimbursement for their exploration and production costs (known as cost oil), and the federal government shares the remaining production (known as profit oil) with the relevant oil and gas companies according to the ratio set forth in the respective PSAs. Recently, a new law ended Petrobras's mandatory operation and minimum stakes in the pre-salt area. Now, Petrobras only has preferential rights for the operation and minimum stakes of each pre-salt area to be offered in a bid round, and for those areas that Petrobras does not exercise its preferential rights, any company may be the operator, provided that such company qualifies as an operator A.
PPSA is a 100 per cent state-owned company created to represent the federal government in the consortium, and is responsible for the management of the PSAs. PPSA cannot perform upstream oil and gas activities and will not make investments, but has very important responsibilities, including managing and supervising PSAs and representing the government in the operating committees. PPSA is entitled to appoint half of the members of the operating committee, including the chairperson. The only criterion used to determine the winning bidders is the percentage of profit oil to be given to the government. Signature bonus under the PSA regime has a fixed value, as well as the minimum work programme and the local content. The special participation and payment for area occupation or retention, both part of the government take in the concession regime, are not applicable under the PSA regime. The winners (individually or in a consortium) of the bid will bear 100 per cent of the exploration and production costs, but will receive as payment a share of the profit oil and will have the right to reimbursement of the cost oil (oil and natural gas equivalent to exploration and production costs), subject to payment of the applicable government take. In both regimes companies are required to comply with local content commitments as well as mandatory investment in research and development (R&D). Although the concessionaires or contractors under the PSA are entitled to explore and produce oil and natural gas, Brazilian reserves, including reserves in the continental shelf, territorial sea and exclusive economic areas, are property of the government. Concessionaires have ownership over the entire volume of the oil and natural gas produced under the concession regime, where the volumetric measurement of the oil and natural gas produced is made according to the ANP's regulations. For blocks within the scope of the Pre-Salt Law, the ownership is transferred to the oil company at the production sharing point, where the production is shared between the government and contractors. Oil and gas are freely exportable in Brazil and there are no limits or quotas applicable to oil and gas production. Nevertheless, the export company must be authorised by the ANP to perform such activities. The exporting and importing companies must present reports and information to the ANP on each sale. Furthermore, the exportation of any goods, including oil and its by-products, must necessarily be recorded in the national integrated system for international commerce, SISCOMEX, which is an online platform that enables the government to control international trade by establishing a one-way flow of information. Requirements of the maritime authorities (ANTAQ and the Navy), the tax authorities (the Secretariat of the Federal Revenue and the state tax secretariats) and the Brazilian Central Bank (currency exchange regulation) will also apply. Notwithstanding this, in emergency cases in which the domestic supply of oil and natural gas is impaired or threatened (which must be declared by the Brazilian President), the ANP may limit the export of hydrocarbons, as well as of its by-products, after giving 30 days' prior notice to the companies. The portion of production on which restriction applies will be determined on a monthly basis considering the participation of the company in the national production of oil and natural gas in the month immediately preceding. So far, Brazil has not faced this situation. There is no specific requirement applicable to the sale of oil into local markets, but only to its by-products. The overall taxation regime applies for oil and natural gas sales in the local market. Some quality requirements must be observed by companies selling natural gas. Prices for oil and gas are freely stipulated between the parties according to the market price. However, the ANP establishes the minimum price for the oil to be considered by the ANP for the calculation of government takes or eventual cost oil. Anticompetitive practices in connection with the exploration, production, transportation, refining or marketing of crude oil or crude oil products are subject to the scrutiny of the Brazilian Antitrust Authority (CADE), and may subject companies to penalties. Generally, the ANP's prior authorisation will be required for any assignment of interests. The rationale only applies to direct transfers, as the ANP recently changed its understanding and no longer evaluates indirect transfers (such as mergers). Only Brazilian companies duly qualified as per the ANP's requirements for technical, legal and financial qualifications are entitled to receive the title to the participating interest in both the concession regime and the PSA regime. No fees are required and no preferential purchase rights upon transfer are reserved for the government, neither in the concession regime nor in the PSA regime. The ANP takes on average from four to six months to approve an assignment request. Currently, the ANP is reviewing its assignment procedure, and several changes are likely to be implemented in the upcoming months – as an example, the ANP intends to change the effective date of the assignment. In addition to the ANP's approval, CADE's clearance may also be required if the groups involved in the transaction meet the following revenues threshold as set forth in the Brazilian antitrust laws: (1) at least one of the groups involved (seller or buyer) registered gross revenues in Brazil in excess of 750 million reais, during the fiscal year immediately before the transaction; and (2) at least one of the other groups involved registered gross revenues in Brazil in excess of 75 million reais, during the fiscal year immediately prior to the transaction. In order to obtain CADE's approval, the payment of a 45,000 reais fee is required. The transfer of licence rights for exploration and production of oil and gas to third parties is generally analysed by CADE under the fast-track procedure. Thus, CADE usually takes between 30 and 45 days to approve such transaction. CADE's approval is required by the ANP as a condition for the ANP's approval. The oil and gas industry is usually taxed at the same rates for indirect (IPI, ICMS, ISS, customs duties, CIDE) and direct taxes (IRPJ, CSLL, PIS and COFINS) applicable to most Brazilian companies. REPETRO is a special customs regime for the industry that allows the suspension of federal import taxes (i.e., customs duties, excise tax and PIS/COFINS on imports), or Brazilian federal import taxes, on the importation of goods intended for the exploration and production of oil and gas by certain eligible entities. Recently, the federal government extended the REPETRO regime until 2040. REPETRO only applies to those goods listed by the Brazilian tax authorities. The entities that may be eligible to use REPETRO for the importation of eligible goods are: (1) the beneficiary of a concession or permit to carry out the activities of research, or exploration and production of oil and gas in Brazil; and (2) those entities hired by the concessionaire under charter agreements or to render services related to the performance of the activities involved in the concession or permit, as well as their subcontracted entities. temporary admission regime: full suspension of Brazilian federal import taxes levied on certain goods of foreign origin that were actually imported on a temporary basis, for a fixed period of time. After the period of temporary admission, the goods must, among other options, be re-exported, destroyed, transferred to another special customs regime, or dispatched for consumption in Brazil (in the case of dispatch for consumption, the full payment of Brazilian federal import taxes will be required). At the state level, VAT (value added tax) benefits may also be available depending on the legislation of each state. Agreement No. 130/07 has authorised Brazilian states to establish a tax reduction on the import of certain REPETRO-eligible goods related to the oil production phase, such that the total tax burden applicable to such transactions corresponds to 3 per cent or to 7.5 per cent, depending on whether the importer intends to register VAT credits or not. The Agreement has also authorised Brazilian states to exempt or grant a tax reduction so that the total tax burden corresponds to 1.5 per cent on the import of equipment related to the oil exploration phase. There may be other specific benefits available related to goods utilised concomitantly during both the exploration and production phase, related to the drawback regime, among others. In 2005, Law No. 11,196 was issued establishing tax benefits for the oil and gas industry, among others. The benefits include exemption of corporate taxes (IRPJ, CSLL) and IPI. However, Law No. 11,196 also requires that the company meets certain requirements to be eligible for the benefits, especially with regard to mandatory investment in R&D. Article 225 of the Brazilian Constitution classifies the environment as a common usage asset and imposes on public authorities and on the community the duty to protect and defend it for present and future generations. These guidelines are generally established by the National Environmental Policy, outlined in Federal Law No. 6,938/1981, which is considered one of Brazil's main legal statutes on the environment. The National Environmental Policy regulates civil liability for damages caused to the environment, which has a strict liability nature (i.e., irrespective of fault). The sole demonstration of the cause-effect relationship between damage caused and action or inaction suffices to trigger the obligation to redress environmental damages. The fact that the wrongdoer's operations are permitted by environmental licences does not exclude such liability. The National Environmental Policy further expanded the list of parties that may be liable for environmental damages, and set joint and several liabilities among polluting entities. Accordingly, all legal entities or individuals directly or indirectly involved in the damaging or polluting activities shall be jointly and severally liable for its recovery. In the criminal sphere, the Environmental Crimes Act (Federal Law No. 9,605/1998) applies to every person, whether an individual or legal entity, which concurs with certain behaviours deemed damaging to the environment. As a result, upon occurrence of an environmental violation, a legal entity's officer, administrator, director, manager, agent or attorney who concurs with certain behaviours deemed to be damaging to the environment will also be subject to criminal penalties. In the administrative sphere, the non-compliance with environmental obligations may subject the company to sanctions, such as the imposition of fines of up to 50 million reais (according to federal legislation, fines imposed by state environmental authorities might have a different range), interdiction of activities, cancellation of tax incentives and credit lines with governmental financial entities. IBAMA or the competent state environmental agency, in addition to supervising compliance with environmental matters, issues the necessary environmental licences. As a general rule, the state environmental agency has jurisdiction for the environmental licensing proceeding of onshore activities and IBAMA for offshore activities. The environmental licensing procedure requires the presentation of environmental assessments, such as the environmental impact assessment and an environmental impact assessment report by the company, which is mandatory for facilities that perform activities of significant environmental impact. operating licence: authorises the operation, after effective compliance with the previous licences and with the environmental control measures and conditions determined for the operation have been checked. With respect to decommissioning, the operator of a concession area or a PSA area must, upon termination of the agreement, procure the decommissioning and removal of the goods and assets in order to transfer them to the federal government according to the rules set by the ANP. The ANP may require financial guarantees to be presented during the term of the agreement to cover such obligations. Foreign investors must incorporate a company under Brazilian law, with headquarters and administration in Brazil, or acquire interest in a Brazilian company in order to perform operations in Brazil. Operations cannot be conducted by a branch of the foreign corporation. The entire process of incorporating a local entity usually takes from 30 to 45 days to be completed, as of the date the corporate documents are registered with the commercial registry until the day the company is able to fully operate with all other required government licences and registrations. All documents related to foreign entities must be notarised by a public notary, stamped by the Brazilian consulate and duly translated into Portuguese, by a sworn translator enrolled in any commercial registry. The company must also be registered with the Brazilian Central Bank. Companies must comply with the local content commitment undertaken in the applicable bid round. Generally, if the commitment is not accomplished, the ANP may impose a penalty of 60 per cent over the amount not complied with, in case the percentage of local content not complied with is less than 65 per cent. If the amount not complied with is more than 65 per cent, the penalty may vary from between 60 and 100 per cent of the amount not complied with. In 2013, the ANP published rules and criteria for the procedure of local content certification. For the 14th bidding round and third PSC bidding round, the ANP promoted changes in the local content, reducing the local content levels and the penalties for non-compliance. Now, the penalties are limited to a maximum of 75 per cent of the value of the required minimum local content. However, companies are no longer able to request waivers for local content commitments that were not fulfilled. All companies established in Brazil, foreign or Brazilian, are required by law to hire Brazilian employees, observing the minimum proportion of two-thirds of Brazilian employees and one-third of foreign employees in the company (which includes the headquarters and each branch with more than three employees). This proportion must also be observed in relation to the payroll, meaning that the remuneration received by the foreign employees must be limited to one-third of the overall payroll. In order to work in Brazil, a foreign employee must have a working visa and fulfil all of the requirements established by the Brazilian National Immigration Council. In this sense, there are two types of visa that allow foreign employees to work in Brazil: (1) a permanent visa: granted to a foreign citizen who will take a position of manager in a Brazilian company (officer), and is usually granted for the maximum duration of five years; and (2) a temporary visa: granted to foreign nationals coming to Brazil for short periods of time with an employment relationship with a Brazilian company. Brazilian law requires that foreign investments be registered with the Brazilian Central Bank to entitle the foreign investor to overseas dividends, interest on equity and funds related to repatriations of capital. The law establishes broad rules governing the reinvestment of profits and the payment of royalties and technical assistance fees. Foreign investments must be registered with the Brazilian Central Bank's computer system by means of the declaratory electronic registration. After the foreign currency funds are exchanged into local currency, the Brazilian beneficiary company must register the investment electronically with the Central Bank, in the currency in which the funds have been actually remitted to Brazil. This registration is necessary for the remittance of dividends to the investor, for obtaining additional registration upon the reinvestment of profits and for the repatriation of the capital in foreign currency. Federal Law No. 12,846/2013 was recently enacted, and it regulates civil and administrative liability of companies for the performance of corrupt acts against the government. Such law establishes a straightforward criterion to input responsibility on legal entities, whether national or foreign, for any act of corruption harmful to the government. Parent companies, subsidiaries, affiliates and consortia will be jointly and severally liable for the performance of corrupt acts. The sanctions include the publication of the conviction and a fine that can reach 20 per cent of gross sales of the financial year preceding the initiation of administrative proceedings. If it is impossible to apply such criterion, the fine shall vary between 6 million and 60 million reais. Such actions may also result in the suspension or partial banning of activities, and, in severe cases, the compulsory dissolution of the corporation. After a long period of hardship caused by the international landscape and the instability of Petrobras, the Brazilian oil and gas sector has undergone major changes throughout the past year and a half. Important regulatory and legislative developments are taking place in the country aiming at maintaining the momentum of growth in production rates and direct government incomes. The unprecedented success of the latest bid round proved Brazil's strength in attracting investment from the largest players in the industry. Now, as the exploration and production projects become increasingly complex and capital-intensive, mainly in the pre-salt areas, the current challenge for the government is to modernise regulation and live up to a fast-maturing market environment in order to consolidate Brazil's position as a continental leader in the energy commodities business. the fifth bid round for small fields. The federal government considered the 15th bidding round a success. Even though only approximately 30 per cent of the total blocks offered were awarded (22 out of 88), the 15th bidding round had the largest total signature bonus in history for a concession round: over 8 billion reais. It also had the largest signature bonus offer for a block, at 2.82 billion reais for block C-M-789. This block – among other granted record-breaking areas – is located just outside the pre-salt polygon, highlighting the potential of this area. The pre-salt bidding rounds were also successful, with Exxon, Qatar Petroleum and BP making their way into Brazilian pre-salt areas. Almost all major IOCs presented bids in the second and third bidding rounds, leading to aggressive offers of profit oil share for the government. The competition was more intense for the areas of Uirapuru and Dois Irmãos. The federal government plans to receive at least 24 billion Brazilian reais until 2020 bidding rounds, and the possible discovery of commercial petroleum resources will increase government participation and Brazil's energy security. One of the most relevant changes occurred in the pre-salt: the federal government revoked the mandatory operatorship of Petrobras in consortiums under the production sharing regime. This is a major opportunity for the global industry in upcoming bid rounds. This legislative trend is especially noteworthy in light the undergoing discussions in the National Congress to open up the onerous assignment regime to investments from other companies. The federal government is also reviewing the deadlines established for the exploration phase of the blocks granted on the 11th and 12th bid rounds, given the difficulties faced by concessionaires in obtaining environmental licences for such blocks, and the current challenging oil prices. In addition, as discussed above, the federal government has recently extended the REPETRO regime for 20 additional years (i.e., until 2040). In addition, the MME has loosened local content percentages and penalties. Local content requirements have long been a topic of discussions between the government, E&P companies and suppliers. In fact, disputes between suppliers and E&P companies related to local content have been challenged in courts as opposed to being resolved administratively, as was the case in the past. These changes, reducing the percentage of local content requirement, seek to provide more legal certainty to investment, increasing interest in future bidding rounds, especially in view of the regional competition for investment with Mexico. Another regulatory development expected shortly is the enactment of a regulation by the ANP that will facilitate upstream financing, and finally acknowledging and allowing the implementation in the country of widely used funding methods in international practice, such as reserve based lending. In addition, Petrobras' divestment programme, intended to reduce the indebtedness of the company and generate value for its shareholders, has been receiving important accreditation from public authorities, and the initial resistance presented to the programme by several sectors of the government is now significantly diluted. A recent important development in this regard was a decision of the Brazilian Federal Accounts Board (TCU) that favoured Petrobras' strategic partnerships with private companies to facilitate the sale of assets. The goal of partnerships and divestments within the strategic plan is to amount US$21 billion until 2019. The TCU also recently brought up a discussion on pre-salt unitisations by ordering the removal of two blocks from the 15th concession round and possibly from one of the areas to be offered in the fourth pre-salt contract bid round. These discussions focus primarily on the effectiveness of the dual-granting regime currently in force in Brazil for E&P activities, and although incipient, may lead to greater legislative discussions on the issue. 1 Giovani Loss and Felipe Rodrigues Caldas Feres are partners, and Nilton Mattos is a senior associate, at Mattos Filho, Veiga Filho, Marrey Jr e Quiroga Advogados. 2 Recently a new law was passed in the Brazilian Congress, changing the wording of the Pre-Salt Law and ending Petrobras's mandatory minimum stake as well as its mandatory operatorship in the pre-salt area.